We’ve had a challenge today about some of our practices. Some of the claims we don’t believe to be true. This blog is our response and explains our approach where predator management is concerned. Making the decision to employ legal, lethal methods of predator control is never easy. In fact, it’s a practise we go to great lengths to avoid until we can see no other viable conservation alternatives and when the need is sufficiently great. In the case of saving the curlew, unfortunately that’s where we are. Our biggest wader is in serious trouble. 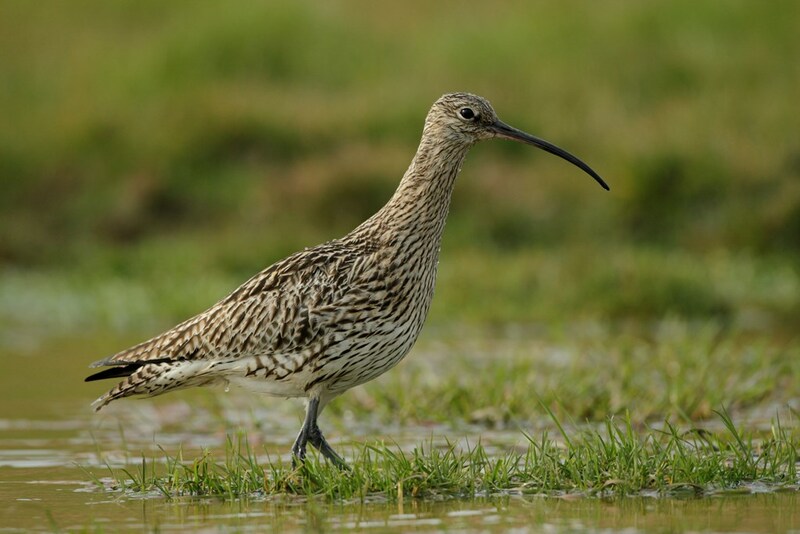 Since the mid-1990s the breeding population of Eurasian curlews in the UK has halved. This decline has global implications as the UK is home to more than a quarter of the world’s breeding curlews. Vast tracts of moorland, rough pasture and hay meadows, which once rang to the sound of the rising, bubbling cries of these birds have fallen silent. The main reason for the decline is that too few pairs of curlew are producing sufficient young to maintain numbers. This is primarily due to changes in land management (agricultural practices and conversion to forestry), which has made curlew much more vulnerable to predation. Recovering the curlew is a high priority for the RSPB so we are undertaking a five-year recovery programme to improve the conservation prospects for the species It includes a science-led project to test the combination of habitat management and predator control interventions to inform the development of ‘curlew-friendly’ land management options across the wider landscape. Working with a range of partners, the trial management is being undertaken across six key areas in the UK: two in Scotland, two in Northern England, one in Wales and one in Northern Ireland. The sites represent a mixture of RSPB reserves and privately-owned land. Eastern Moors, managed jointly by the National Trust and RSPB is one such trial site. Read more about the curlew Trial Management Project here. Working with experienced, professional contractors who can carry out the predator control as expertly as possible is key for us. We follow a rigorous recruitment procedure to check that our contractors have the required skills and qualifications, and to ensure they have no history of criminal activity involving wildlife. They are required to keep detailed records of the predator control they undertake, which they share with the RSPB on a weekly basis. In the short-term there are no non-lethal options available because the curlew is a widely dispersed species so options like predator fencing are not going to work across the wide expanses of the uplands that curlew inhabit. In the longer term, if we are to have any impact on the species, it will require working together with farmers, land-managers, other conservation organisations and communities to encourage the widespread adoption of curlew friendly land-management practices across the landscape. This includes working with land managers to reduce forest edge effects (forests provide cover for predators) and to improve habitat through changes to grazing regimes, as well as reducing the release of vast numbers of game birds into the countryside, as these may act as a major food source for foxes, so could contribute to the high number of predators currently present in the UK countryside. I know this is a hugely emotive and sometimes controversial subject. I know that not everyone is happy with this course of action. In fact, sometimes we’re not either. But in this case – based, as always, on scientific evidence – it’s what we think is needed. We always do our best to be honest and transparent with everything we do, including publishing an annual blog on the predator control we carry out as part of our work. As well as the comment below, a few queries have been raised through twitter about our use of Larsen traps whether we have an exit strategy for predator control. -	That killing will not have an adverse impact on the conservation status of the target or other non-target species. Sadly, Larsen traps are the only realistic and effective lethal means of controlling crows. We use them because they target the territorial crows that evidence shows are the most damaging to wader nests and chicks. The call bird is seen as an intruder by the territorial birds who will then try to drive it away. Shooting crows raises practical problems especially at it would have to take place during the day on land that is often used by people. But shooting can also be much less targeted to the territorial birds, therefore we may end up killing more birds. We do, of course, ensures that the trapping of crows is carried out in accordance with the General Licenses and relevant animal welfare legislation. Our policy for use of Larsen traps exceeds these legal requirements, as all contractors must check traps twice a day to ensure that the call-bird has access to food and water and that suitable welfare provisions are made for any caught birds. Fresh water is provided by a dispenser attached to the trap so that it cannot be knocked over. Call-birds are changed regularly. All contractors complete a daily checklist each time the check is undertaken and this is submitted to the RSPB. Regarding the issue of having an exit strategy for predator control, I would refer you to the conclusions from the recent review that we published about the impact of predation on wild birds where we say that there is “a real need for research to understand how landscape-scale management could be used to provide longer-term sustainable solutions to reduce the number of generalist predators and their impact of species of conservation concern”. So, we intervene to provide a lifeline for threatened species while we continue to seek what is inevitably a longer term ambition to secure more fundamental change in the way land is managed. I agree with Simon Tucker. Publicly converting from a bird conservation charity to 'Nature's Home' was and will continue to be a mistake imo. I've nothing at all against all wildlife, and have foxes, badgers, dragonflies etc in the garden. However, the more animal lovers who join, the more members as a percentage will be against any form of animal death, regardless of whether it conserves endangered bird species. I even include deaths of non native species like grey squirrel and brown rats. Yes, help conserve all wildlife, but don't sell our organisation as something that 'protects all wildlife' as Thomo not so long ago 'quoted'. There will always be some people who want to make trouble for the RSPB and you'll never be able to satisfy everybody. I'm sure you have the balance as right as is humanly possible, Martin. Doing the best for conservation means taking decisions based on sound science and common sense, and being honest and transparent about it - and that's what the RSPB does.